Despite the common feeling screen-time is replacing face-to-face interactions, many cities and towns across the country are renewing their commitment to creating public spaces that encourage residents to come together and participate in the community. For architects, landscape architects, and city planners who are working on these types of renovation projects, it can be challenging to strike the right balance between 1) adding value for the surrounding neighborhood, 2) improving the location’s aesthetics, and 3) establishing functional upgrades – without imposing an entirely new vision of the community onto its residents. Here are some examples of how innovative tension structures can help you deliver on all three of those goals. The Chippewa Riverfront Park Project in Wisconsin was once the home to a series of dilapidated buildings – which were reducing area property values and wasting riverfront space. Over the course of several years, the City of Chippewa Falls bought those properties and removed the old structures to make way for the new community park, which includes a fishing pier, winter ice skating rink, restroom facilities, free WiFi, and an outdoor music venue. 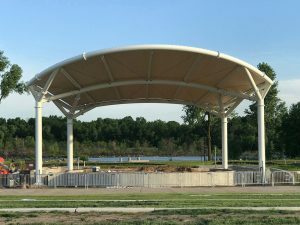 The 3,000-seat amphitheater features a stage area and a 2,732-square-foot stage canopy – created by the team at Tension Structures. By transforming an unused area of town into a celebrated community riverfront park, the City of Chippewa Falls has found a powerful way to add overwhelmingly welcomed value to the surrounding neighborhoods. The District Wharf Project in Washington, DC had the goal of revitalizing the mile-long stretch along the Potomac River to create an inviting space for local residents and tourists. 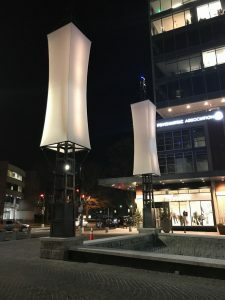 As a part of the renovation, the team at Tension Structures designed seventeen fabric lantern shades to illuminate the waterfront walkway with a unique and festive aesthetic. 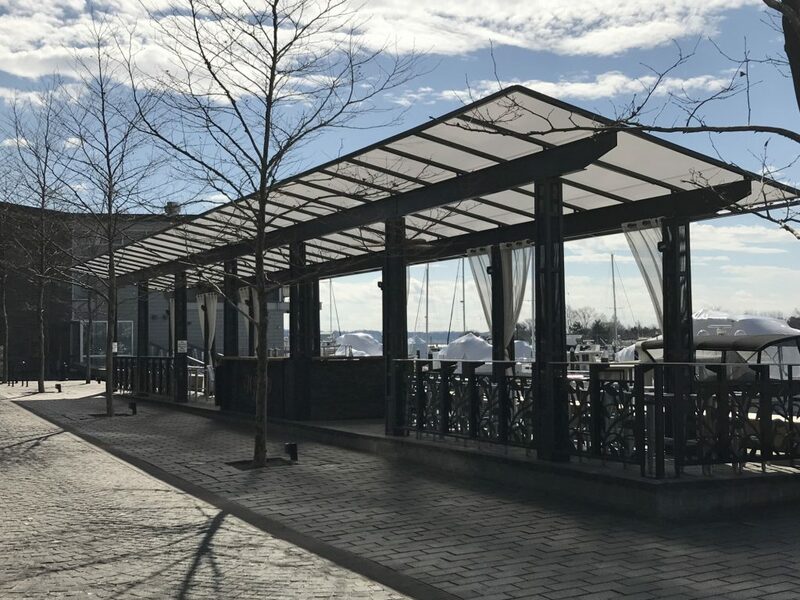 Additionally, a beautiful and versatile canopy was built along the waterfront to provide a protected seating area. For The District Wharf Project, it was clear that improving the area’s aesthetics was an essential step towards creating an inviting environment. The lighting became a priority because it improved the area’s style and safety. 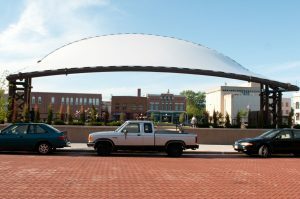 The Wausau City Square Park Project in downtown Mosinee, Wisconsin required a fully functional performance stage as the culminating element of the greater revitalization of the city’s “400 Block.” The stage canopy needed to be capable of supporting lighting and speaker systems. Ultimately, it was designed by the team at Tension Structures to span 66’ across and soar 37’ into the air, with a shade coverage area of 2,794 square feet. The city’s downtown revitalization project wasn’t just about creating a more welcoming space for residents to enjoy; it was centered around the need to create an incredibly functional destination where residents and tourists could gather to enjoy live entertainment, festivals, and other community events. Are Tension Structures Right for Your Next Project?